A hospital caring for a seriously-ill nine-month-old baby has said it may have to go to court for a decision over whether to keep on treating him. Luke Winston-Jones from Holyhead, Anglesey, has been in hospital most of his life with a rare genetic disorder. Alder Hey Children's Hospital in Liverpool said there was an "extremely poor outlook" for Luke and his case presented a "real ethical dilemma". The hospital is taking further specialist advice before making any legal application. Luke was being treated at Ysbyty Gwynedd in Bangor but was transferred to Alder Hey for tests last week. His mother Ruth has pleaded with Alder Hey to continue treating Luke, who was born with three holes in his heart. In a statement, Royal Liverpool Children's Trust said: "Doctors and nurses at the trust have explained to his parents the extremely poor outlook for Luke. "Rare cases such as this present a real ethical dilemma. "Where there is a significant difference of opinion between paediatric medical specialists and parents, it may be necessary to put all the facts before a court for proper and impartial consideration. "The trust is actively supporting the parents and will be reviewing the position carefully over the next 48 hours." In July, Ysbyty Gwynedd deferred a planned application to the High Court over "direction" on how to treat Luke and whether they must continue to treat him. Ms Winston-Jones had accused health officials of "playing God" with her son and has pleaded with staff at both Bangor and Liverpool to continue to keep Luke alive. She has contacted supporters of her cause - including the Duchess of York - to get their help. 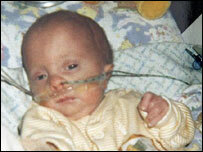 Luke suffers from Edwards Syndrome, also known as Trisomy 18. Ms Winston-Jones, who is separated and has two other children Andrew, 12, and Sophie, seven, has previously said she would treat Luke at home if a court order to withdraw hospital treatment was granted. Last week, a judge ruled doctors should not resuscitate a baby born very prematurely if she stopped breathing. 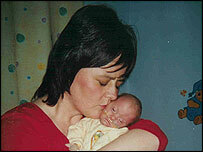 Charlotte Wyatt was born weighing just one pound with serious heart and lung problems. Her parents had argued doctors should revive her if necessary. But Mr Justice Hedley sided with Portsmouth Hospitals NHS Trust, which had said her quality of life would be so poor she should not be treated.